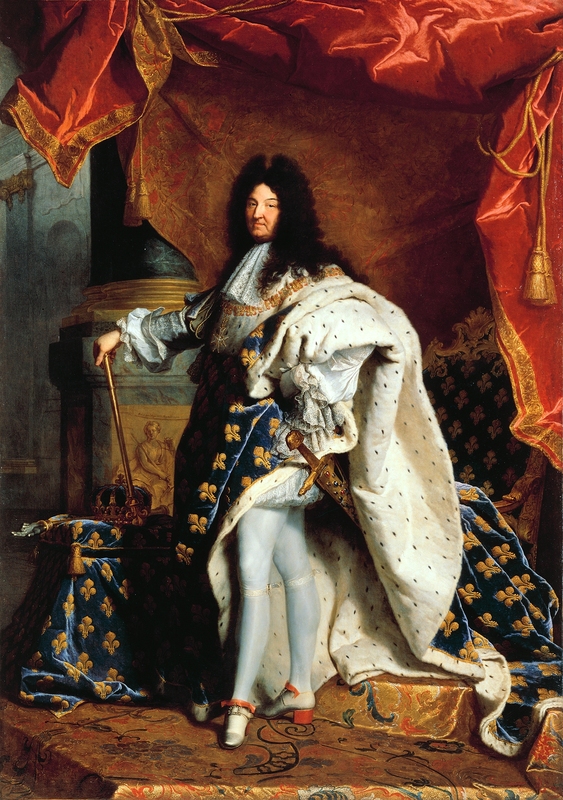 The rise of Louis XIV, the Sun King, and his court at Versailles, signaled the dawn of the Classical Baroque era in art, architecture, music, and fashion. It was defined by natural, curving silhouettes, flowing lines, gold filigree, rich colors, and overall voluptuousness. Clothing contained an abundance of lace, pearls, ribbons, and gold embroidery, and was refreshingly free from the excessive decoration of the Renaissance. Fashion changed rapidly: the growing middle class would copy the styles of the nobles, who would in turn create new fashions to stay more “refined” than the middle class. Unlike earlier periods, where bodices, sleeves, skirts, jackets, and breeches were made to mix and match, clothing during this period was made as separate and entire matching outfits, often made of the same fabric. This was referred to as en suite, and was the predecessor for our modern-day “suit.” Seasonality also began to be widely used, a grateful relief from yearlong, heavy gowns and doublets as worn during the Renaissance. The most important development of this period was the rise of fashion designers after Louis XIV certified the establishment of a dress-makers guild. This profession contained both men and women. The most popular designers were well-pursued by the nobility and even the middle class. Women. Women’s clothing became much less restricting. Flexible stays replaced hard, tight-fitting corsets. Flowing lace collars replaced stiff ruffs. Large farthingales were abandoned and skirts were merely layered or padded at the hips to produce a full, flowing look. Usually two skirts were worn, the overskirt (manteau) open at the front and usually forming a train or bustle at the back, and an underskirt. Decorative aprons became popular with the middle classes. The plunging neckline called the décolletage became common, often accompanied with wide lace collars. 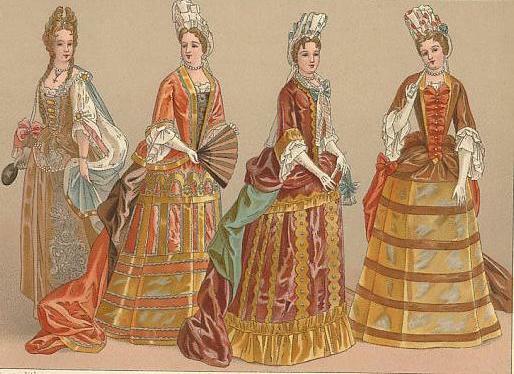 Waistlines were also high during the first part of the period, though long, pointed bodices and stiff stomachers came back during the latter half of the period. Sleeves were large, gathered at the wrist or elbow and often with turned-back lace cuffs. They progressively became more and more ruffled and segmented as the period progressed. Solid-colored silks and brocades were used more often than patterned fabrics, and usually decorations consisted only of lace, tied or rosetted ribbons, limited embroidery, and simple pearl jewelry. Women wore their hair in tight curls at the forehead and on both sides of the head, called “heartbreakers,” during the first half of the period. However, hairstyles progressively became higher (fontage hairstyles). Lips and cheeks were often rouged, something previously only done by courtesans. Face patches made of silk and velvet and cut into small shapes became very popular. Since people believed water was bad for the skin, bathing was not a regular activity. To cover up body odor, people wore profuse amounts of perfume and carried around scented purses. Shoes acquired pointed toes and high heels, but women’s shoes were ironically much simpler than men’s. Jewelry was very simple during this period, consisting of single strings of pearls or diamonds or sometimes a ribbon tied around the neck. 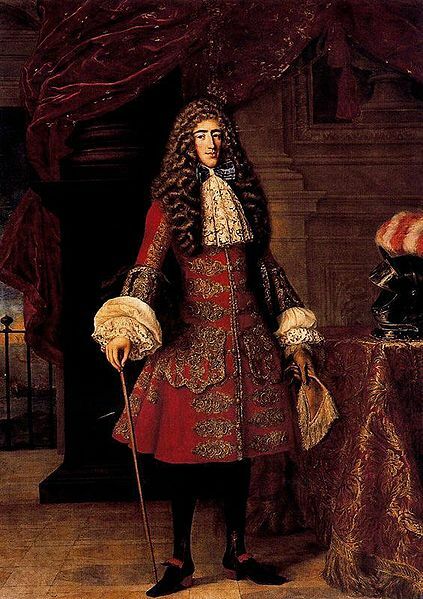 Further into the reign of Louis XIV, however, men’s fashions became more extravagant. Rhinegrave breeches, or long, loose, overly decorated pants ending just below the knee (which really looked like skirts) became popular and were worn with lace ruffles called cannons just below them. Large collars were replaced with long lace ruffles or jabots at the opening of the neckline. Square-toed, high-heeled shoes with rosettes replaced boots. Men curled their hair and grew it past the shoulders or simply wore wigs of the same style. 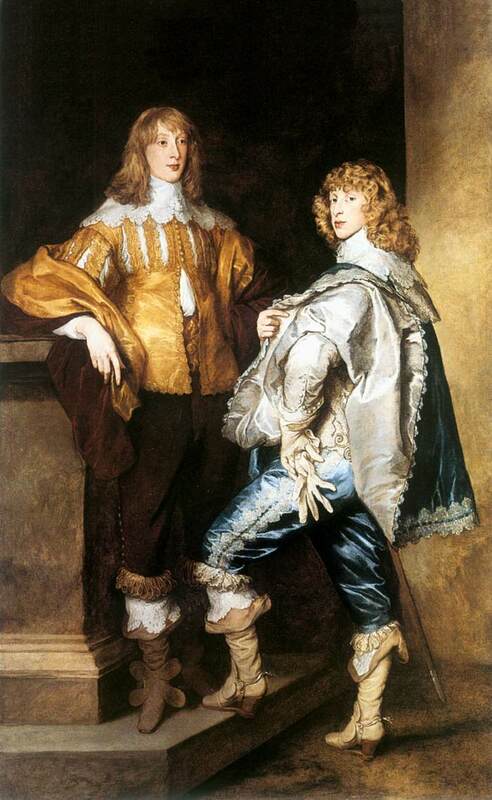 Before the death of the Sun King, men’s fashions underwent yet another change (see left image). Breeches became close-fitting and either tied, buttoned, or buckled at the knee, with hose worn underneath. Long coats with braid-trimmed buttonholes (brandenburgs) and large, folded-over sleeves were worn (think Captain Hook here). Scarf-like steinkirks replaced the jabot. This suite was refered to collectively as the Persian style and still serves as the base of a man’s suit–the coat, waistcoat, and breeches. Wigs became larger and were usually powdered white, still elaborately curled and even longer than before. Although the Baroque period was perhaps not as extravagant in the amount of decoration used as during the Renaissance, it was just as lavish in its display of wealth. Fine ribbon and lace replaced copious amounts of jewels. Elegant embroidery replaced methods such as slashing and puffing. Rich silks replaced highly decorated fabrics. These patterns would continue into the following Rococo period.